The Springsonian Museum is one of many museums in Springfield. 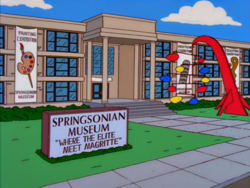 It held an Egyptian exhibit that Homer and Lisa broke into to see. The museum was the victim of a fire dealt by the Springfield Voluntary Fire Department. It is a few blocks from Springfield's Russian district. The museum gets its name from the Smithsonian Institution in Washington, D.C. Modified on July 7, 2017, at 14:21.